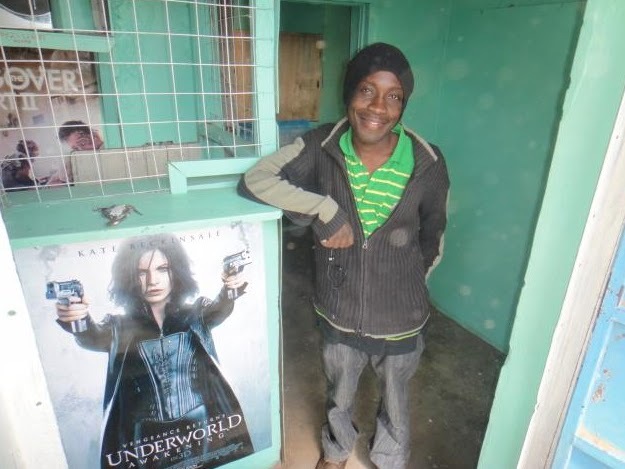 "There’s No Business Like Show Business"
I recently met Sidney Lugohe Mungasia at his shop in Ongata Rongai near Nairobi recently. Sidney runs the business of typing, scanning and photocopying and a video/music library from his shop. I have done an MBA. My class of about 50 had people from 20 nationalities. Sidney’s demeanor reminded me of some of the smartest people in my class. He is confident but not overly extrovert. He put me at my ease the moment I met him (and I thought that was part of MY job). He is positive about future and expresses his ideas with a self-assurance that somehow smells of humility and not cockiness. Sydney lost both his parents in a car accident when he was in school, yet he finished his school and also went to college where he got a diploma in banking and finance. He also wanted to pursue a course in accounting but couldn’t because of financial constraints. After his diploma he worked for Barkley’s for a while but later left because he felt constricted in a 9 to 5 job and wanted to be independent. When I asked him why he chose this particular business he said, “There is no business like show business”. I guess you end up watching many of the movies you sell. But frankly, that didn’t sound dramatic at all coming from him. Sydney used his Zidisha loan to upgrade his computer (he added three dvd writers, increased the speed and the RAM and bought a UPS). He also upgraded his printer- the new one has a scanner and a photocopier. He also spent on advertising. When I asked him if he could do all this with the amount he borrowed from Zidisha, he told me that he also invested all his savings. He was able to increase his income due to these improvements and is planning to move to a bigger shop soon. With the next loan Sidney wants to expand his business. His future plan is to have a sort of entertainment hub where people could come to meet friends, eat, play video games or watch movies. Sidney is 28 and when I asked him if he was married, he smiled shyly and said that perhaps next year. As a gesture of my good wishes in this regard I asked him to pose for a photograph with this big poster of Kate Beckinsale outside his shop and he happily obliged. Its was with great pleasure that I met Zidisha’s ‘Kenya Client Relationship Manager’, Mr. Achintya Rai, at my shop a short time ago. We discussed at length some of the issues that affected my business including its future prospects and opportunities, which I have envisioned to achieve in the forthcoming future. Rai has already posted most of the issues we talked about, and am happy to say that I have incorporated in my plans, to implement some of the creative ideas that he suggested to me. As he has said, my vision is to expand into an full-size amusement center, which will be more of a social meeting place for the young generation rather than an entertainment store, which is its current business model. I’ll be glad to meet more of Zidisha’s representatives and lenders so that I can show them how much their support has helped my business. It’s with sincere gratitude that I would like thank you all, who have had faith in me. I look forward for future engagements.